Tags: A-line, Bridal, Dark Maroon, Fawn, Frock, Mehndi Mayon Henna, Rust, Sharara. 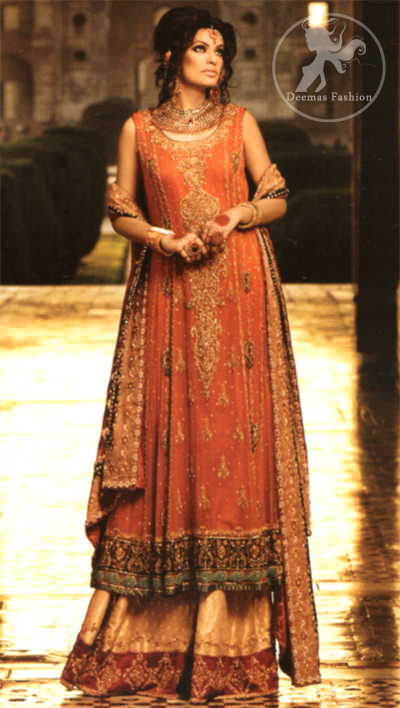 Rust A-line anarkali frock with fawn sharara. Frock features stunning embellishment on neckline, front and back hemline. Fawn banarsi chiffon lehenga with embellished border all around the bottom. Dupatta contains embroidered border on four side edge. Crystal stones crafted all-over the dupatta.